Ok, as I type this my two kids have been TAKING TURNS riding their new PlasmaCar up and down the hall in our house. It's been a half hour now..lol It's a rainy day and this toy took them away from the TV in an instant! No wonder the PlasmaCar keeps getting awards! There are no pedals, gears, batteries, or any electrical parts. Just inertia, centrifugal force and friction. Science! 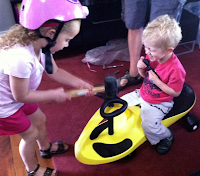 :) I love that it is a quiet toy (kids still playing on it....been an hour now) The PlasmaCar needs a smooth surface so it won't move on carpet, but it works great on sidewalks, driveways, parking lots, etc. Find a PlasmaCar near you! The PlasmaCar was easy to put together and you can even purchase replacement parts if needed. 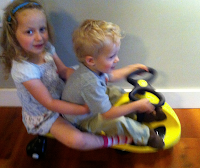 This is a durable sturdy car that my husband and I even took a turn on. :) You can keep up on PlasmaCar on Facebook and Twitter! We LOVE it! 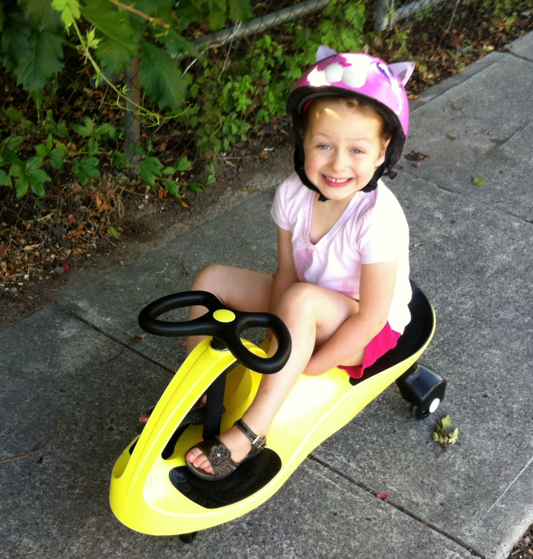 One reader will win a PlasmaCar! US/Canada only excluding Hawaii and Alaska. Will not ship to P.O Boxes. Entrants must be 18 years and older. PlasmaCar color to be shipped is dependent on stock so will not be able to choose. Review/Bloggers and Spammers are not eligible to win. All entries will be verified. Giveaway will end July 23rd at 11:59 pm. Sponsored by PlaSmart. I was given a PlasmaCar to review. No other compensation was received. All opinions are my own. This promotion is in no way sponsored, endorsed or administered by, or associated with, Facebook. We hereby release Facebook of any liability. Winner will be contacted by email and will have 48 hours after the giveaway ends to respond before another winner is picked. 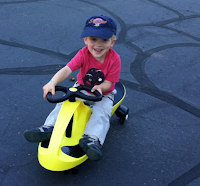 I love the idea of the Plasma Car and I'm sure my son would too! Hope I win! We have one of these cars and my kids love it. It would be great to have another! I would love to have this for grandchildren. I love this, it is so unique and would be so much fun for children. I would love to win this for my grandbaby..
hoping to win this for my girls! I need something new to entertain the kiddos and this would be great! My kids would go nuts over this! These cars are so neat looking and I love that they made it for many others to enjoy it not just the little ones. Great giveaway! This would be so much fun for my kids...thanks for the chance! My children would love a plasma car. Plus, it looks like it would be a good workout for their arms. What a fun ride-on toy! My little grandson would love this! Love this giveaway! I know my girls would love it. I love these cars. I've been looking at them for years. These cars look so cool, my friends rave about them! My friend has these for her son and loves them!!!! I love this concept. Thanks for the chance to win this for my son. I have been meaning to buy one of these forever! My son would love this "car"! My 4 year old just watched the video and said "Someday I would like to ride on that car." 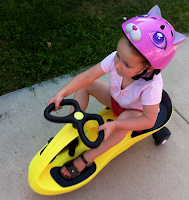 What a great active play toy for kids! My son would love this toy and it would be such a great Christmas gift. I'm not sure who would like this more...my son or my husband! We have 4 kids who would have so much fun with this! thank you for a great giveaway - my kids would LOVE this!! I have been trying for months to win one. My niece would love it! My son would love for me to win! Thanks! Thank you for this wonderful giveaway. If I won this my niece and nephew would love it. Thanks you for the fun and fantastic giveaway! My son would love to have this! Away from the TV?! No way! I have this one on my 'Wish List' in Amazon. Would love to win it! Thanks for the giveaway. This has been something that my twins have wanted for a long time. We have been trying to win one of these for months and months! Thanks for the giveaway!! This is an awesome giveaway! I never even heard of the plasma car! Great giveaway! My boys would have a blast with this!! Thanks for the fun giveaway. My son would just LOVE this! Such a neat car - thanks for the opportunity to win. I've been eying a plasmacar. Would love this! Thank you for the chance to win, both my boys birthdays are coming up and they would love this! My grandson would have a blast with this car. Thanks for the chance. Thanks so much for this great giveaway and for all you do! My nieces and nephews would LOVE this! My mother on law has these and my kids love them. This would be great to win! always wanted to get one of these for my kids!! :) would love to win this!!!! My kids would love to fight over this. I would love to win this for my son's birthday! My kids would be fighting over this giveaway! My grands would enjoy the plasma car so much!! Thanks so much for the great blog & page & Thanks for this great giveaway. 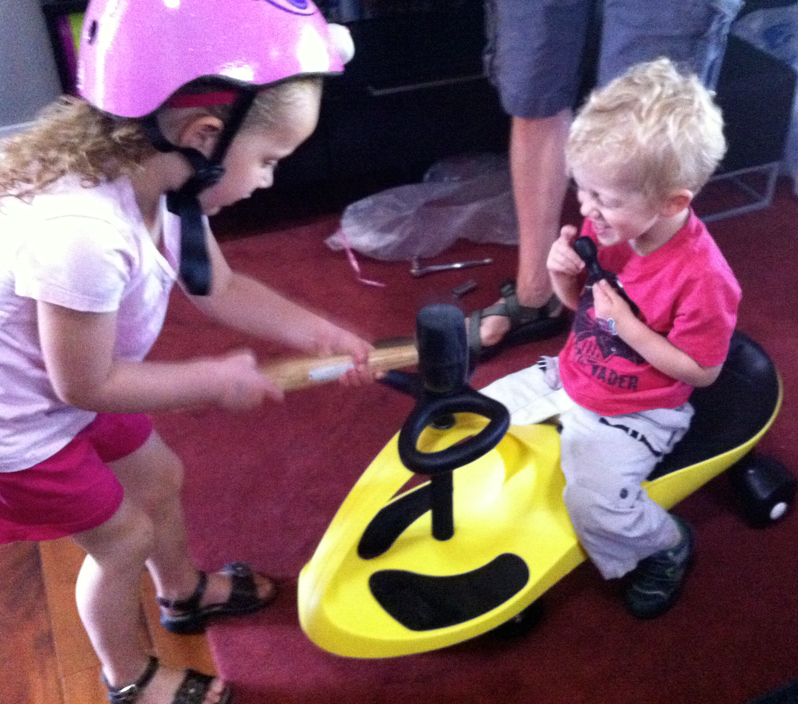 Alicia S. amsstar5 (at) yahoo(d0t) com: My kids would totally be fighting over this way cool toy! wow, they look like fun! My little girls would love this thanks for the giveaway.. This would be a fab gift for my kids! This looks like fun! My kids would love to ride it! These are fun! Thanks for the giveaway!